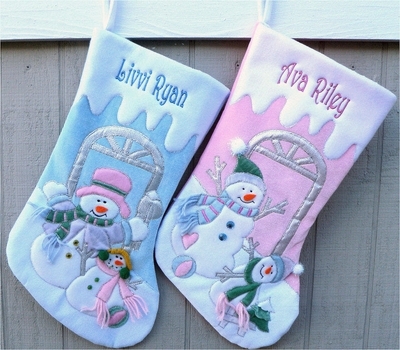 This Stocking is the first in a set of two. It shows a Parent Snowman and a Child Snowman enjoying the snow together. It is the Blue Body Boot Stocking on the photo. We have a sample picture of the stocking monogrammed with silver or pink metallic embroidery thread ... click on the thumbnail image in the top right hand corner of this page to see a larger version.